Disclosure: I was sent the decorations to review free of charge from Oriental Trading. All opinions in this post are my own. I did not receive any other compensation for this review. I added links to the particular products for your convenience, but not for any compensation. 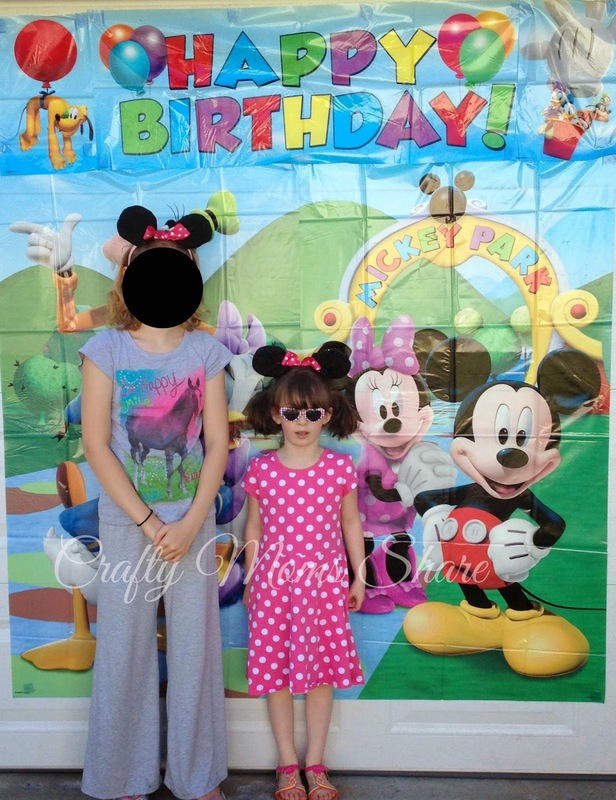 So yesterday was the Minnie Mouse Half Birthday Party. Hazel had a blast. 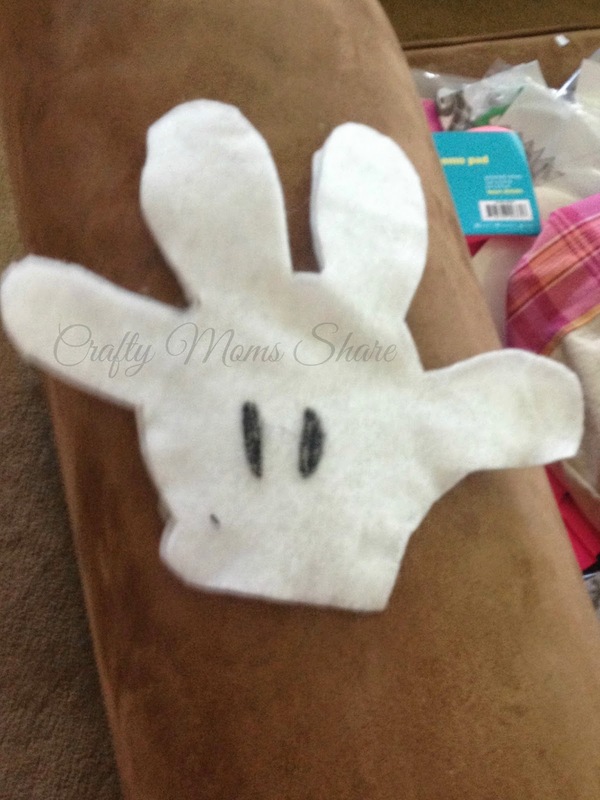 Now we spent a lot of time getting ready for this party and have posted many DIY ideas already. We also received five items from Oriental Trading that we used for the party. 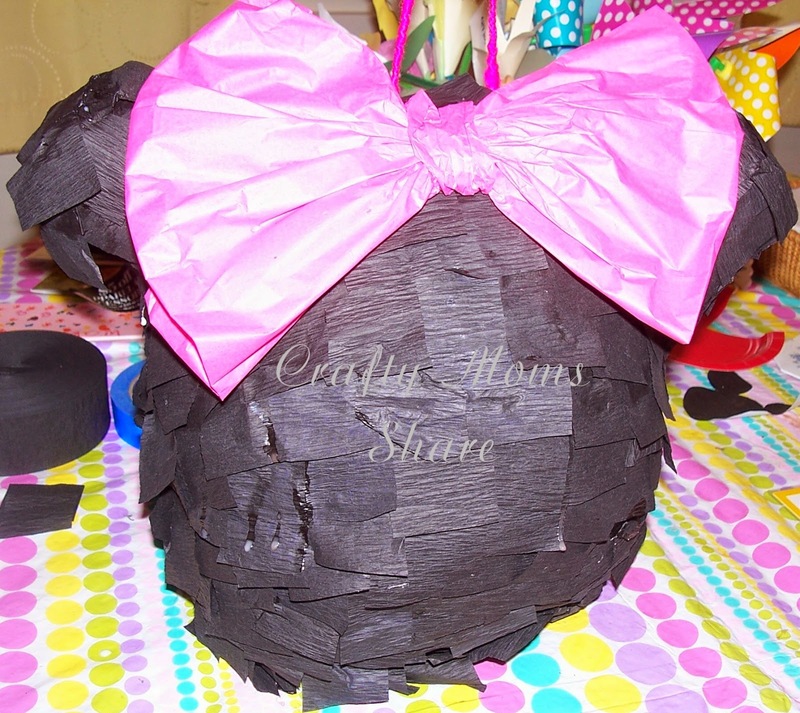 A few weeks ago we shared our Minnie Pinata and the black streamers we used to make it. We also used the black streamers for a pinata stick. I thought we had one so I did not worry about getting one, however we could not find it and think we got rid of it at one point. (Oriental Trading does sell a pinata stick if you do not want to make one.) When we realized we did not have one, I asked Steve if he had an old broom handle and he did. (I think I had seen it hanging around, so in the back of my mind I knew.) He had used it to stir blacktop with, but it was too long anyway, so I cut it down in size. Then I wrapped it with the black streamers--making sure to cover the sharp ends. It felt hard so I wrapped it again with black streamers. Then I wanted to make it colorful like the ones you buy so I used some rainbow streamers and wrapped it again. Then I added some streamers to the top. Besides the sawing, it took me about 15-20 minutes to do the wrapping and decorating. The pinata was a big success. All the kids loved hitting it. When I make another one however I will reinforce where it will be hung since this quickly was broken and the pinata was on the ground well before it was broken. Eventually all the kids got to hit it with the holes made and then one of the tall parents picked it up and distributed the goodies all around and the kids gathered them in goody bags I had for them. 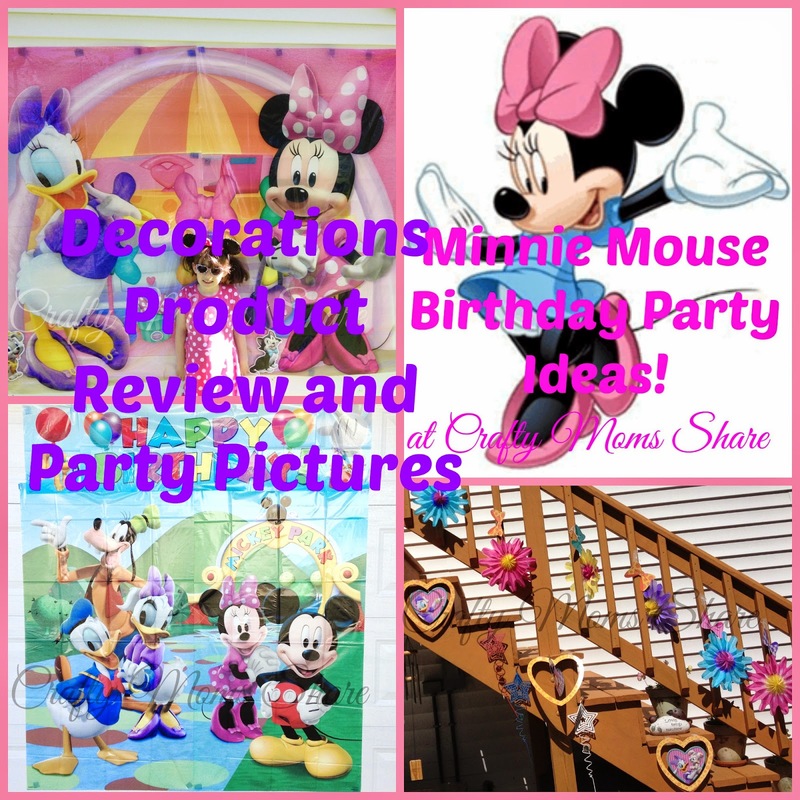 Now another thing Hazel picked from Oriental Trading was Minnie's Bow-tique Dream Party Backdrop and Props Kit. Hazel LOVED this backdrop. We taped it up with painters' tape to the shed and it greeted all the kids as they walked up our driveway. We taped a few of the props onto the backdrop: Bella, Figaro, and the hat box. Hazel and her friends had fun trying the sunglasses and purse, etc. for the pictures. 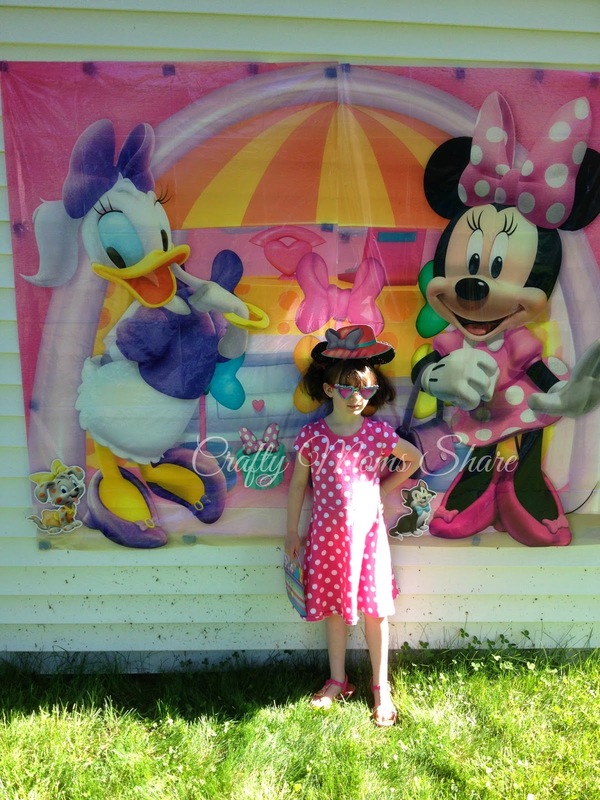 Here is Hazel with the hat, purse and one of the pairs of sunglasses. Before we took it down, I had Steve snap a picture of Hazel and I with it as well. 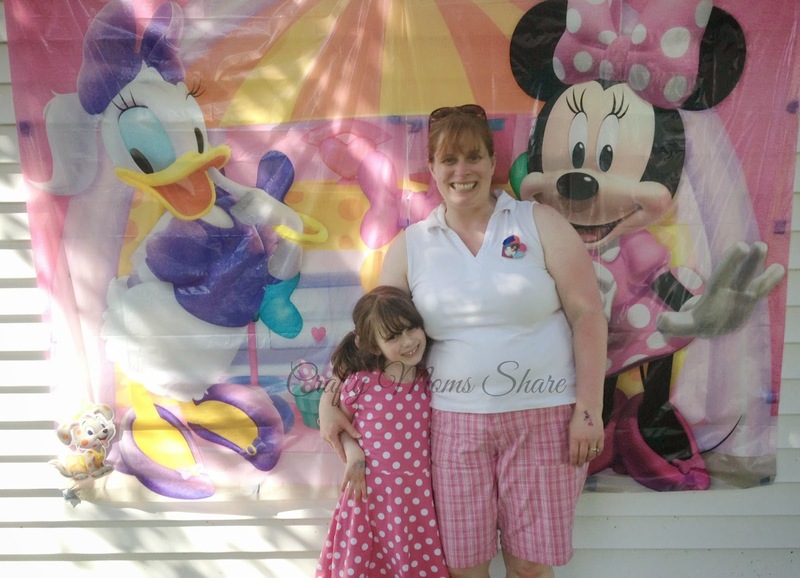 She also wanted to have other characters there, so she picked the Mickey Scene Setter Set. This is huge!! The kids loved it though. I hung this one on one of the garage doors. I used tape because of the wind and the non-flat surface. We did not get many pictures in front of it and Hazel wants to hang it up again. Steve took it down while she was playing with the last guest to leave and before I realized he had. So we will be hanging it up again. I did however get a picture of Hazel and our 12-year-old neighbor in front of it before the party. When our neighbor has some free time (not very often) she will come over and play with Hazel. Hazel loves playing with her. 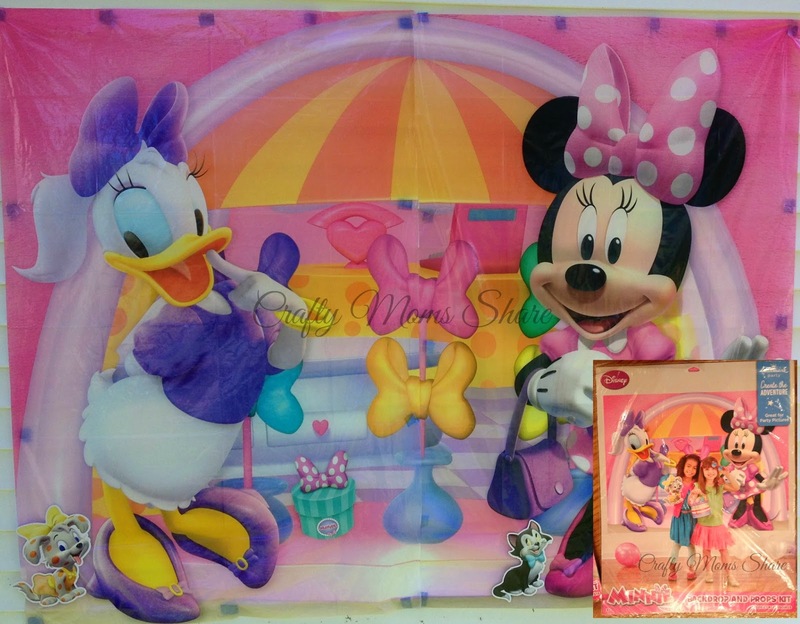 We also picked out the Minnie's Bow-Tique Dream Party Room Transformation Kit. It included three large wall decorations and many small hanging decorations. 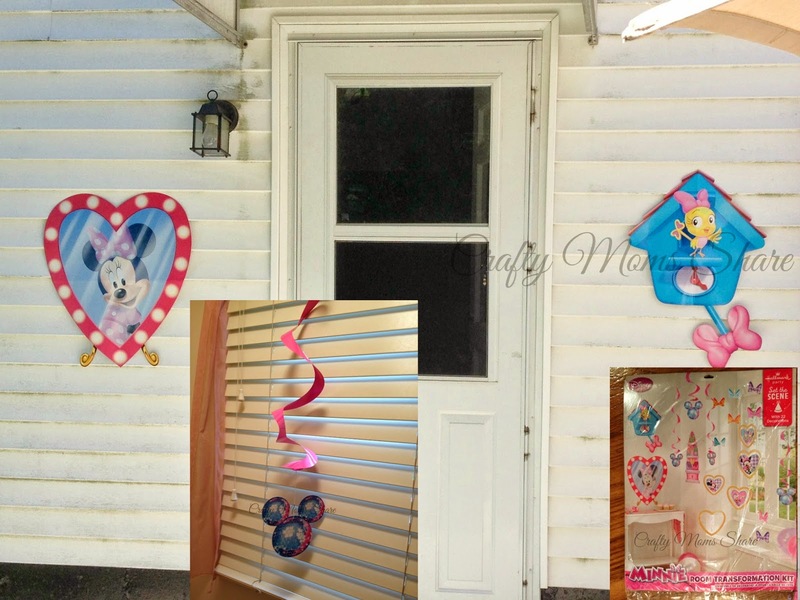 I hung the large wall decorations on the house and garage and the hanging decorations I used in several places. I hung some in the bathroom like the one on the shade and some on the swingset picnic table where we had the "Make a Bracelet" Station. Then I hung most of the rest on the staircase next to the patio. Also hanging on the stairs are our final decorations from Oriental Trading, the Flower Decorations. I love these!! The come folded up and you open them and I taped them shut. 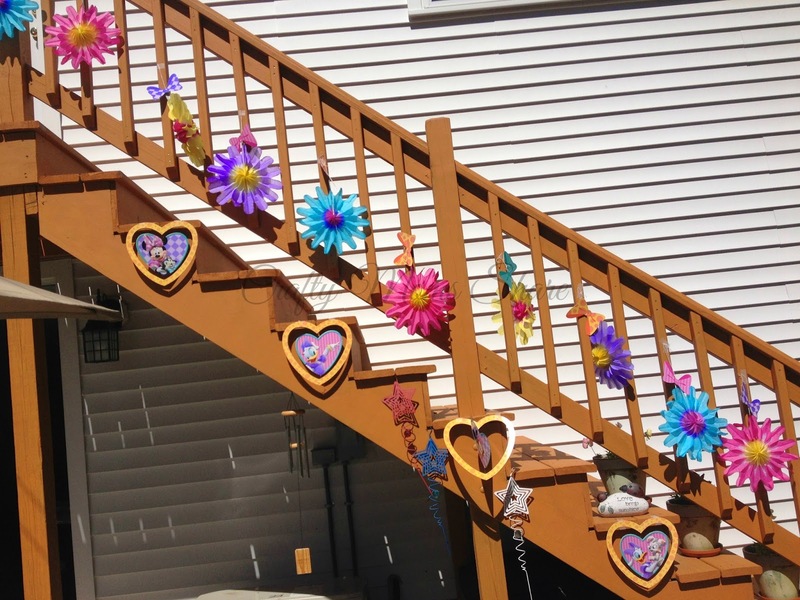 Then I added the bows from Room Transformation kit and hung them along the staircase. I cut the tape and folded them back up after the party and can use them again. They are so colorful and fun!! The bows and hearts came with the room transformation kit. I felt our patio was well decorated along with the theme, and really our whole party area thanks to Oriental Trading. 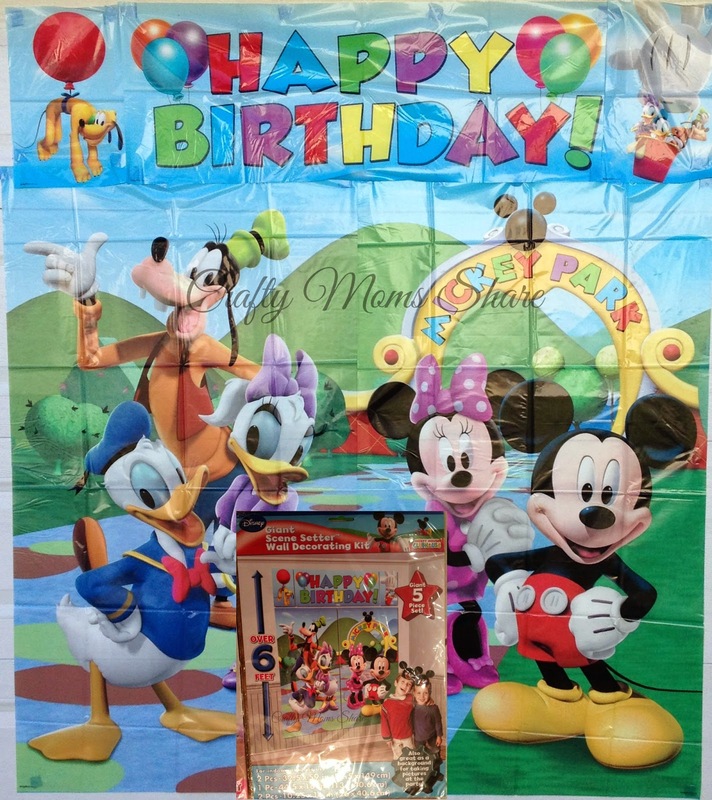 I also decorated using a cheap Mickey Mouse calendar. I think I bought it for a dollar. I framed some of them and put some on the refrigerator (where the drinks were). Some of the framed ones went in the bathroom and some went where the food was served. 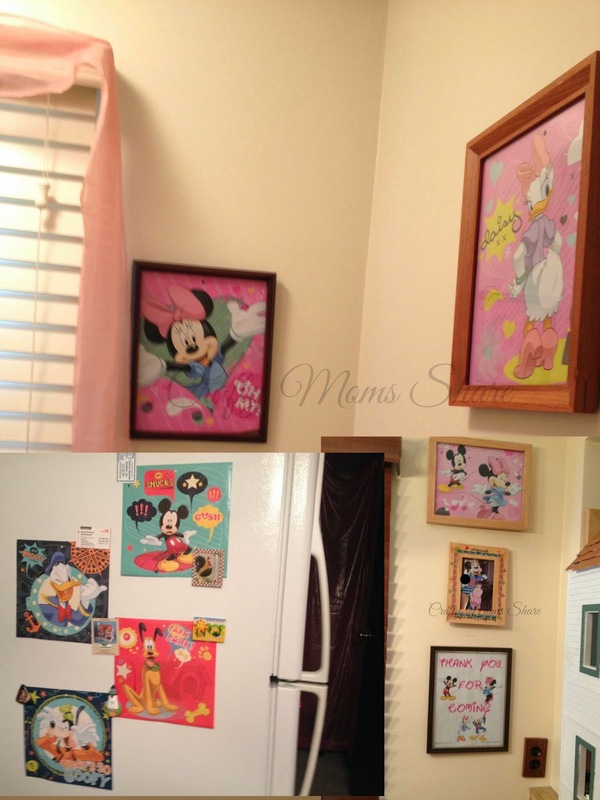 I also used pictures from last year's trip to Disney World and signs I made. I added some bigger small framed sayings into this display after I took the picture. I also made a Hazel's Bow-tique mobile similar to the one I found at The Lovebugs Blog: Lovebug's Bow-tique Birthday Party. I used her printables and changed them a bit. I used her pink bow and then changed the color in Word on them for the different bows and for the open I used the same bow but made it bigger and added "Open" to it. 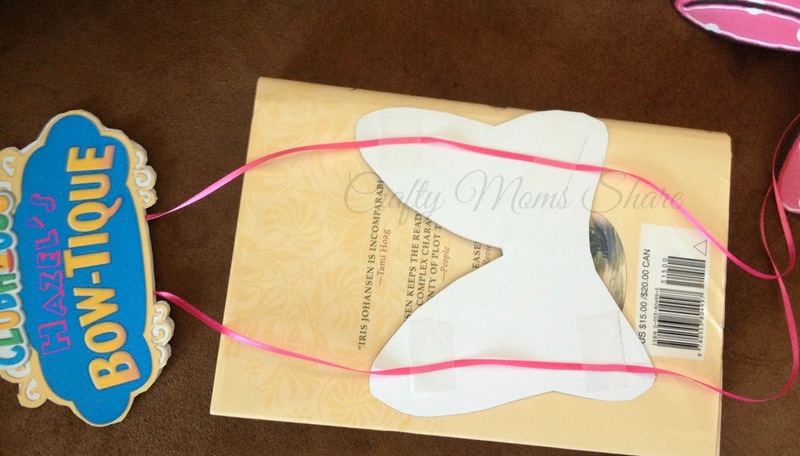 To put it together, I used one piece of ribbon folded in half or looped at the top. I taped the ribbon to one piece and then used glue stick over the entire piece including the tape to secure the other side. 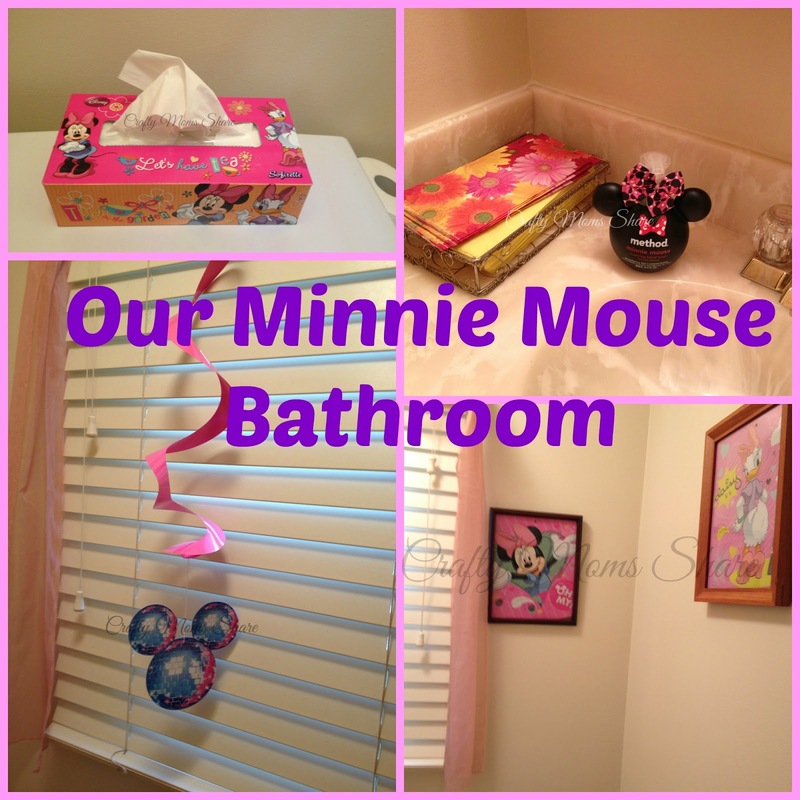 I also decorated our bathroom in Minnie theme. I found the tissues at the Dollar Tree and the soap at Target. My final decoration/toy was a Handy Helper. I found the pattern at Spoonful. I glued the felt and painted on the spots. Then I stuck the whole thing over a wooden spoon. Hazel loved waving it around and then we put it in a display, but we did not take a picture. I was going to share our food, but I think I will save that for another post since the decorations took so much space. Tomorrow is Virtual Book Club for Kids, but Tuesday I will share the pictures of our food and tell you how it all went. Plus I will give you more details on our activities. (Tomorrow's post will share another review of a great product from Oriental Trading! )Sorry I did not take more pictures, but I spent my time setting up and enjoying the party and Steve cleaned up before I had time to get the pictures. I cannot complain since it meant less cleaning for me.